Dr. Gingrich has the God-given ability to make the Word of God relevant to today’s problems by relating it to the walk of believers. His depth of knowledge, his spiritual insight, his practical wisdom, his unique writing ability, and his tireless and unselfish labor are all revealed in his unique outline commentaries. The skillful arrangement of the material in these commentaries makes them suitable to be used in the classroom, in the pulpit, on in the home. 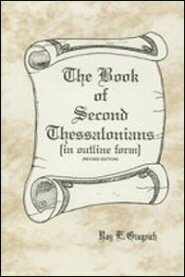 The spiritual quality and the structure excellence of this outline commentary of First Thessalonians is on par with the author’s other writings, which cover all the books of the Bible and have been used by many scores of thousands of believers.